Holiday Gift Guide #4 - SweetTartStyles. For some reason finding a gift for my dad is the hardest thing, men are simple people and pretty much anything makes them happy. So you can never tell if they truly like it or they're just happy they received something, and me being miss perfection, I try to always give the best gifts, here are a few I wrapped up that I think are pretty versatile and almost any dad would like something on here. 1.) A BBQ tool set, not necessarily a "tool set" but all the "tools" dad will need when cooking up some nice bbq on a Sunday evening. It has everything from tools to clean up to the right spatula and fork dad will need to flip or pick up the meat. This one available at Kirklands for $56. 2.) Dad's are infamous for slipping on a pair of crocs or thong sandals, very lazy they just put something that'll get them from home to where they need to go, as long as it's comfy, they'll put it on. Why not let them be comfy in style, with some Toms. Coming in a variety of styles, colors, sizes, any dad will be happy to slip them on and you'll be happy dad can look a bit more modern. Available at Toms.com. 3.) With technology advancing almost everyone has a smartphone and that smart phone has music readily available to play. To make it a bit more better sounding I'm sure any dad will enjoy this iHome player, with a good size, it can fit in his office, room, or can be moved outside for a cook-out or anywhere he needs, made for the iPhone/iPod products but has a auxillary port to connect any phone. This one from Amazon.com for $35. 4.) 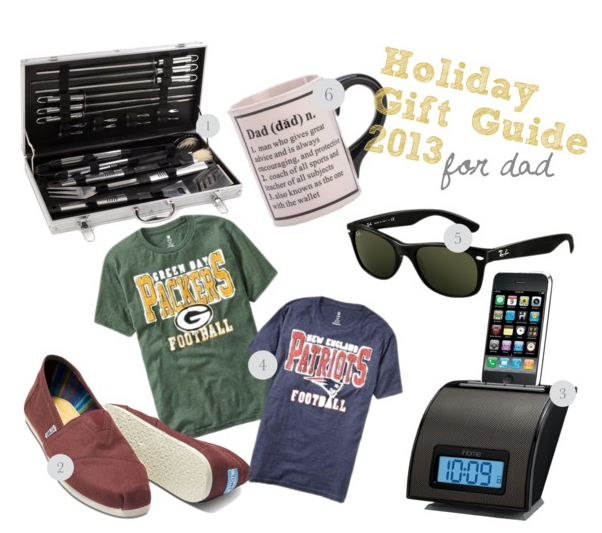 You'll always catch dad's when they are not at work in t-shirts, and almost every dad in the United States are football fanatics, why not get dad a tee with his favorite team on the front, coming in a variety of teams, Old Navy has them on sale for $18. 5.) I'm sure any dad will appreciate sunglasses, easy to wear, go with anything, and block the sun, like I said men are simple people so if it gets the job done they'll have it, sunglasses of any kind will do the job, but some Ray-Bans seem modern and up to date for your old man. Available at Ray-Ban.com or Ray-Ban stores for $130. 6.) Last but not least, the coffee drinking dads, this mug it funny but loving at the same time, you can find it on amazon.com for $7.50.